Welcome to Meta Safe Trading Corporation. 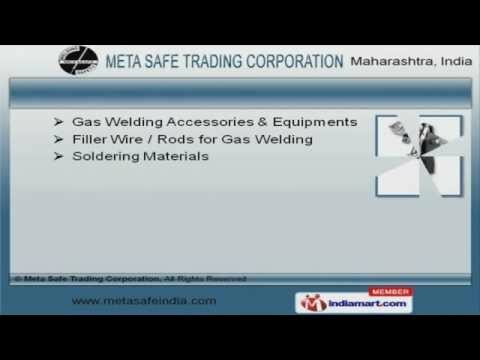 Manufacturer and Exporter of Welding and Safety Equipments. The company was established in 1992 at Mumbai. We are in association with Steelweld Industries and Metasafe Export Private Limited. We are an Authorized dealer of Esab India Limited and Advani Oerlikon Limited and we are backed by Dimensional accurate products and convenient payment options. We offer a wide assortment of Industrial Safety Equipment, Welding Cable and Electrode Holders. Gas Welding Accessories, Soldering Materials and Gas Welding Fluxes offered by us are extremely reliable. Our Eye Protection Goggles, Respiratory Nose and Mouth Masks are in huge demand across the global markets. We also provide Gas Masks, Hand Protection Gloves and Foot Protections that are widely acclaimed in the market. Our organization is highly involved in providing an impeccable range of Safety Stickers, Traffic and Road Safety Devices. Our clients can avail from us an exquisite range of Welding Machines, Cutting Torch and Regulators that are cost effective.